Those of us who hoped against hope that President Donald Trump would somehow not end up scuttling the nuclear agreement with Iran, as he did earlier this week, held out that hope for fear of what this would mean for the stability of the Middle East and the world, for both national and global security. If the U.S. were to hastily pull out of the deal, ripping its foundation from under it, we warned that this would lead, intentionally or unintentionally, to a cascading series of events that would gradually culminate in yet another catastrophic war. We were wrong: Those events are not happening gradually at all. Within 48 hours of Trump’s announcement that he was pulling the U.S. out of the deal, undoing years of diplomatic legwork and effectively setting fire to the entire agreement, Iran and Israel have come closer than ever before to a direct military confrontation. On Wednesday night, a barrage of missiles from Syria struck the Israeli-occupied Golan Heights, which Israel quickly attributed to the Quds Force, the overseas arm of Iran’s Islamic Revolutionary Guard Corps. This attack was provocative, assuming the Israeli military was right to attribute it to Iran, as it marked the first direct attack by Iranian forces in Syria on what Israel considers its own territory (the Golan Heights are considered occupied Syrian land under international law and in the view of most other countries, which do not recognize Israel’s unilateral decision to annex the territory in 1981). The barrage killed nobody and damaged nothing, as the missiles either missed their targets or were intercepted by Israel’s Iron Dome missile-defense system. Nonetheless, Israel responded to this provocation typically, with overwhelming force, launching an overnight series of air strikes on some 70 targets in Syria, which Israeli defense minister Avigdor Lieberman claimed had damaged or destroyed nearly all of Iran’s military infrastructure in Syria. This exchange of fire represents a dangerous escalation of the low-grade war Israel and Iran have been fighting in Syria for some time now. The specter of an all-out war between Israel and Iran is frightening, as it would undoubtedly affect not only Syria but also Lebanon, as well as the belligerent countries themselves. Hezbollah, the militant Shiite party in Lebanon backed by Iran, and its allies increased their number of seats in the Lebanese parliament to a slim majority last Sunday, though that hardly means the party has a firm grip on power. Fearing that an emboldened Hezbollah might drag the country deeper into the Syrian conflict and the unfolding Iranian-Israeli crisis, world powers are now urging Lebanon to uphold its policy of “disassociation” from regional conflicts. Making Lebanon a full participant in another regional conflict would be extremely destructive to the country and a losing political strategy for Hezbollah, but the country could get embroiled in this conflict whether or not Hezbollah necessarily wills it. Needless to say, a reignition of the Syrian war with an expanded proxy dimension, coupled with the spillover of that war into Lebanon, would represent a major destabilization of a region that can ill afford to become any less stable than it already is. Iran’s rivals among the Gulf Arab states are clearly gunning for Israel to turn its considerable military might against Tehran, as indicated by the Bahraini foreign minister’s unusual expression of support for Israel’s right to defend itself against Iran. Bahrain has no relations with Israel and, like most Arab countries, does not formally recognize its existence. That statement might also imply the blessing of Saudi Arabia, which exerts considerable influence over its tiny neighbor Bahrain and which has also been warming up to Israel of late — with both eyes on their common enemy, Iran. So what does this rapidly spiraling situation have to do with Donald Trump and the Iran deal? 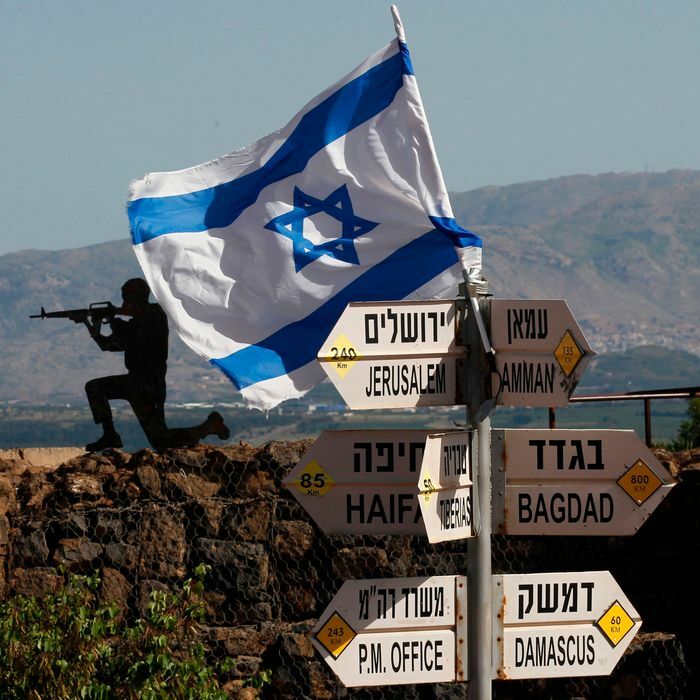 Neither the Iranian strike on the Golan nor Israel’s response were necessarily direct consequences of the deal’s untimely demise, although the former may have been one way in which Iran lashed out in response to Trump’s decision. Israel’s response had undoubtedly been in the works for some time; it could not have assembled the intelligence and firepower for such an attack overnight, but was clearly waiting for an Iranian escalation to trigger a preplanned reaction. Canceling the deal, however, has removed a key obstacle blocking these countries from engaging in a costly and risky war. With the return of sanctions and no reason to ever trust the United States again, Tehran now has a strong incentive to resume its atomic-weapons activities, as a nuclear deterrent may be its only hope of averting an invasion by the U.S. and/or its regional proxies. The minute Israel has plausible evidence that Iran has restarted its nuclear program, it will take steps to stamp out what it considers an existential threat to itself. The prospect of sabotaging relations with the U.S. had been the leash holding Israeli prime minister Benjamin Netanyahu back from doing so preemptively. Now, he may not even wait for the evidence to come in. One quality Netanyahu has in common with Trump’s national-security adviser John Bolton is a fervent desire for war with Iran, with the explicit goal of overthrowing the Islamic Republic. Neither man believes that Iran can be trusted, reasoned with, or welcomed into the international community under any circumstances as long as it remains under clerical rule, and both openly thought the Obama administration was stupid to think otherwise. Netanyahu has been threatening war with Iran continually for nearly a decade; Bolton has been advocating war for at least as long. Both men have egged Trump on to cancel the deal. Critics of the Trump administration’s approach to Iran like to complain that it offers no alternative to the deal. This is, strictly speaking, incorrect. High-ranking officials within this administration have been crystal clear for some time about the alternative they have in mind: namely, war and regime change. Now, the neoconservative Washington Free Beacon reports that the administration is working on plans to foment revolution in Iran after it reimposes crippling sanctions, suggesting that it is looking for ways to achieve regime change without violating Trump’s isolationist campaign promises by starting another foreign military adventure. For armchair generals like Bolton who dream of Tehran in flames, an Israel-Iran war might have some appeal as another way to achieve their objective without the pesky need of selling the American people on yet another open-ended war. In that case, however, the question the administration must answer is this: What’s their plan for if and when Netanyahu gets in over his head and says he needs our help?